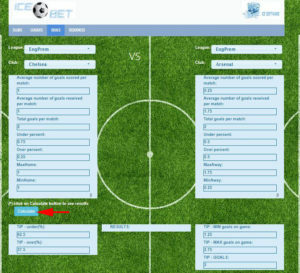 Ice2bet I can describe with a few words: easy to use, save your time, essential soccer statistics in easy to understand and compact form and most importantly it is FREE. 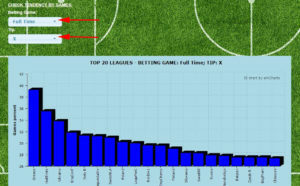 In this sections, from analyzes all past games for all teams, you can find the ” Top/Bottom 10,20,50,100” for some specific betting game. Pick your condition (red arrows) and click on Search button !!! After click on Club’s rows you can see full chart preview of Club statistics ! You can see League tendency by weeks for most popular betting games. In the second part of this sections you can see League tendency by one betting game (tip) according to your choice(red arrows). 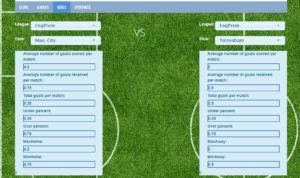 Here you can pick two teams and site console calculate and tips goals for you, based on your choice and the past matches of both teams. 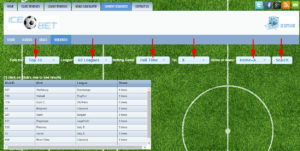 After you choose both teams click on Calculate button and you will see tips for goals. 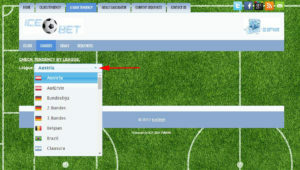 Choose the options (red arrows) and you will see the Clubs sequences for selected betting game tip.